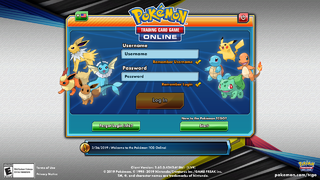 Pokémon Trading Card Game Online (also known as Pokémon TCG Online or PTCGO) is a free-to-play online collectable card game. Colorless is the only type to not feature in Daily Challenges, although an asset for it exists. Not all types have been featured in Special Challenges, either. Some achievements and Gem images are still present in the files. Figure if the models are the same from the main games. Winning with any of the Lost Thunder Unown's abilities displays a "VICTORY!" screen spelled out from Unowns. All existing Unowns however are in the game's files, even "letters" not needed for other languages. More cards might have also been playable by the AI but Bulbapedia/the internet has no full documentation. Figure if decklists were inside early versions of the game's files. All unobtainable cards have been removed from the servers around January 2016. This former currency was used with redemption code cards found in physical booster packs. Booster Credits could be redeemed for booster packs of the player’s choice from HeartGold & SoulSilver through Boundaries Crossed expansions. This code card method ended on July 2013 when codes from a booster pack became redeemable for a virtual version of that specific booster pack. The February 7, 2014 update automatically redeemed all remaining credits for Boundaries Crossed packs. The Achievements system was retired on March 25, 2015. Achievements had no special effect on the game. This mode allowed players to play their chosen deck against another randomly selected player like ranked battles (later renamed to Versus Mode), but did not count toward player rank or earn trainer tokens or bonus wheel spins. The practice battle option was retired on March 25, 2015. Players could undo playing certain cards on the field like basic energies unless it would break the game's state. This option was removed on November 6, 2015 to "streamline gameplay and better match competitive play environments". UI changes have also made less common to misclick during a game. On March 30, 2016, the Unlimited format no longer existed in Versus Mode and Tournaments (now only avaliable in friend battles), being symbolically replaced by the Legacy format. Cards previously banned in the Unlimited format for game balance can be played again, but due to these changes the format has virtually no playerbase. The in-game chat for online battles has been replaced by canned messages and emoticons on September 26, 2016. Gems were a purchaseable currency only avaliable to Canadian players from April 19, 2013 to October 29, 2018. Similar to Trainer Tokens, they could be redeemed for items in the in-game shop or used as a currency for trading with other players. Extract cards from the cache. Vivillion (XY 17) has two different obtainable cards, one which changes its artwork deppending on the set language.